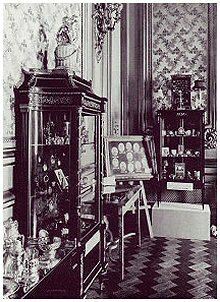 The "Charity Exhibition of Fabergé Artistic Objects, Old Miniatures, and Snuff Boxes", was held in St. Petersburg, Russia, in March 1902. 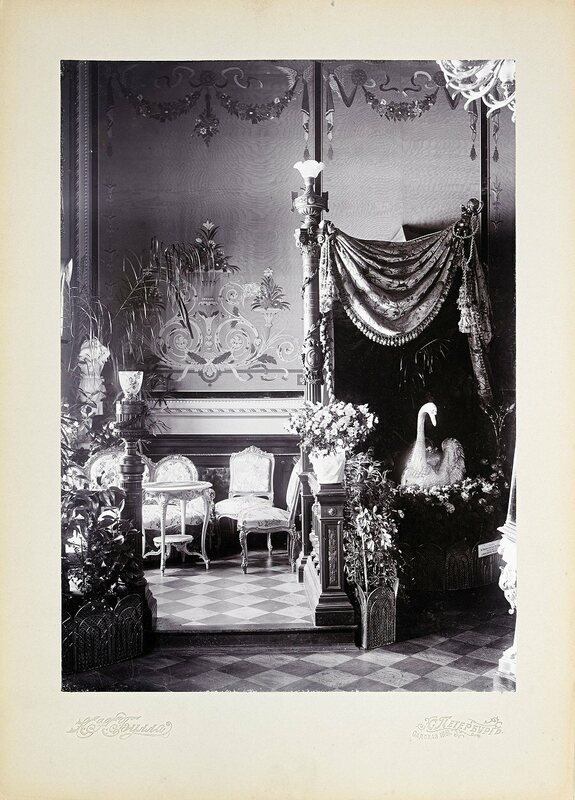 It was an exhibition in aid of schools under the patronage of the Empress Alexandra and many of the items exhibited belonged to the Imperial Family. 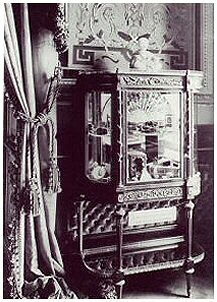 After the Paris Exhibition Universelle in 1900, it was only the second time the public could see the Imperial Eggs, and it was the very first time Imperial Easter Eggs were exhibited on Russian soil. 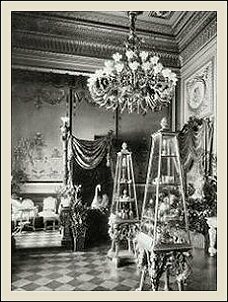 It was said that the Eggs were created in utmost secrecy and were a private matter between the Emperor and Fabergé, something even some of Fabergé's workman did not know about. 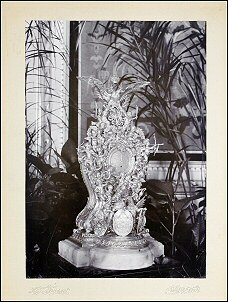 Perhaps this was so in the beginning, when the first Eggs were presented, but obviously no longer in 1902 as we can see from the image above. Clearly visible are many of the Eggs belonging to both Empresses. Nothing secret here as "Niva" was at the time the most popular publication of Russia and sold on the streets of St. Petersburg. 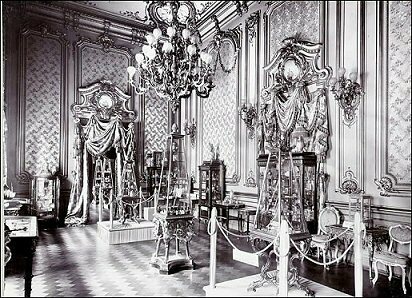 The first Russian exhibition of Fabergé art works was organized in the Von Dervis* Palace or Mansion in St. Petersburg. The owner of the mansion, Vera Nikolaievna, widow of Baron Paul Pavlovich von Dervis had in 1889 made the decision to completely remodel her mansion at 28 English Embankment and moved next door to another property owned by the family. 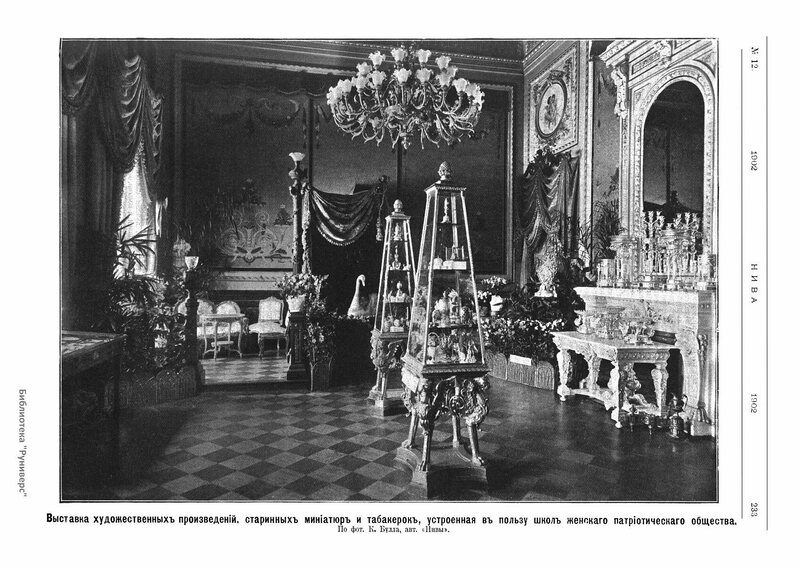 As she was enormously wealthy, her husband having made his fortune in the railway construction business, she was able to employ the most successful St Petersburg architect, Alexander Krasovsky and ordered him to carry out a complete reconstruction and the mansion became home to some of the most spectacular state rooms in St. Petersburg. 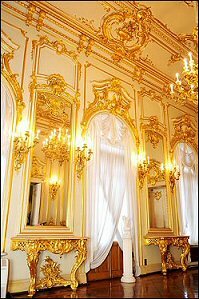 The new design reflected the Florentine style which was very fashionable in St. Petersburg at that time. 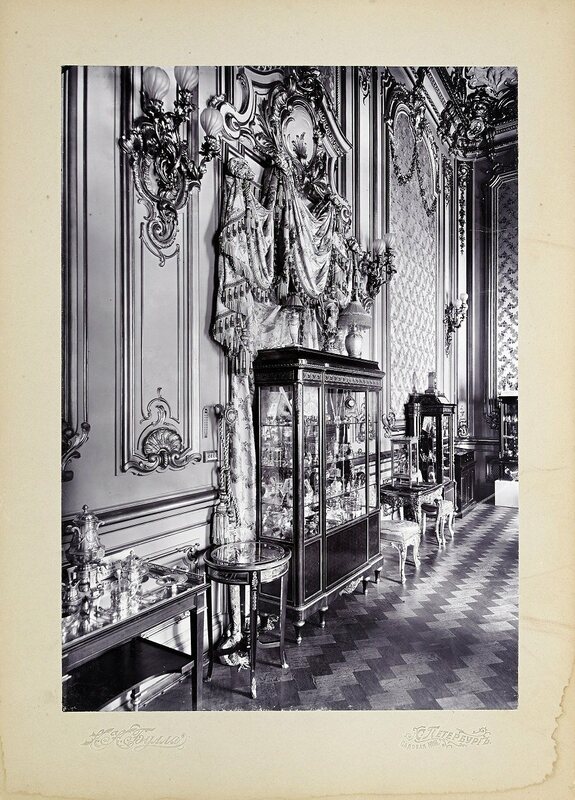 When construction was complete, Vera Nicholaievna allowed her wonderful new mansion toe be opened to the public, hosting the now famous 1902 exhibition which was installed in the sumptuous Gold Drawing Room. Now that is a way to hold a house warming party! 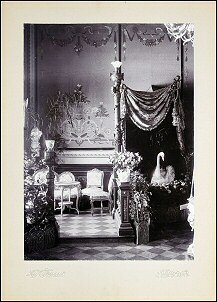 Poor Vera Nikolaievna died in 1903 and the palace was sold to Grand Duke Andrei Vladimirovich, the Grand Duke who after the October Revolution, married the prima ballerina Mathilde Kschessinska in France. But that is another story. 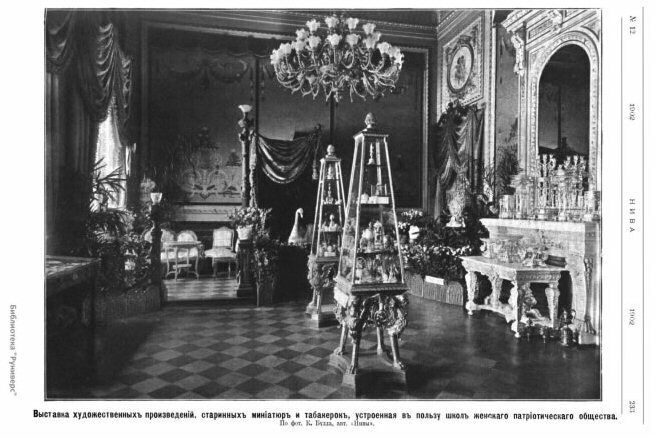 As everything of beauty or money, the mansion was nationalized and used for various purposes after the 1917 revolution. 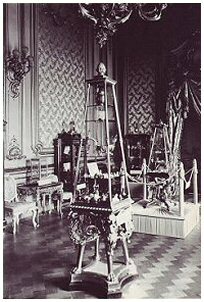 The exhibition** excited great curiosity amongst Petersburgers, and even the Emperor Nicholas II and his family honoured it with their presence. 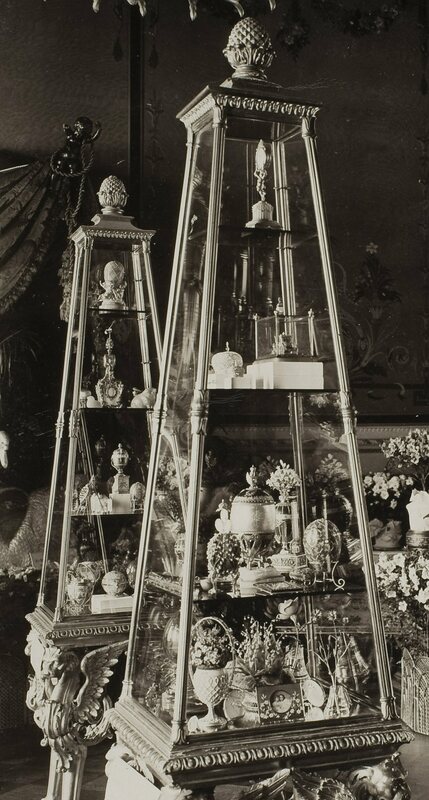 Many came to view the items from the private collections of members of the royal family, which had been presented to them on their birthdays, weddings and other family celebrations. 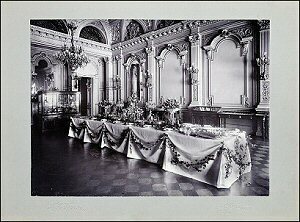 The Emperor wrote in his diary: March 7, 1902 "...Sergei and Ella had breakfast with us. She and Alix went to organize a charity fete of Faberge things belonging to our family..."
I always thought that there was a series of ten photographs, but odd as it may seem, I found more than the ten photographs, however all from the same angles, so some of these photographs are probably cutouts or enlargements of the original ten. I have posted these photos here; click images for larger versions. With the photographs below I think I have a bit of all here is on this exhibition. 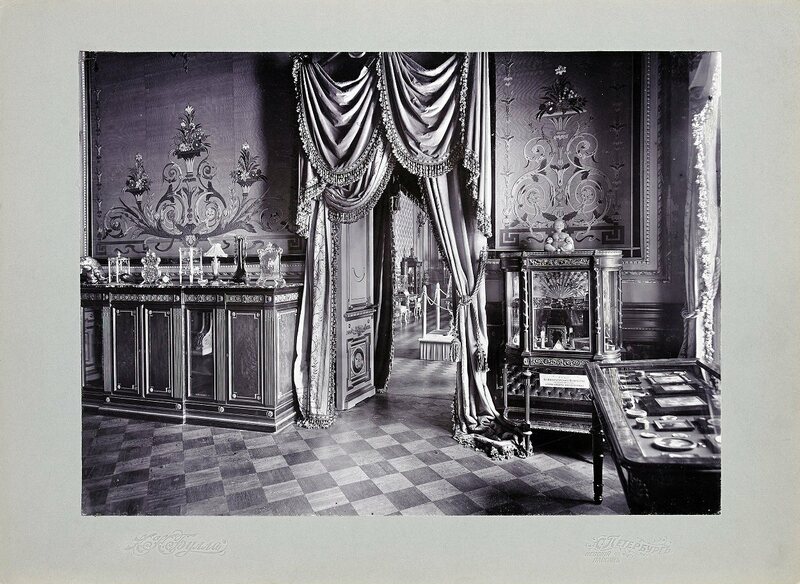 Many people have tried and identified the Fabergé items in these photos. There are the flowers, the Tsarina's triangular clock, the 25th anniversary clock of the other Tsarina, still with the Imperial monogram, the buddha we now call Onassis Buddha, the embracing amorini, and so much more. 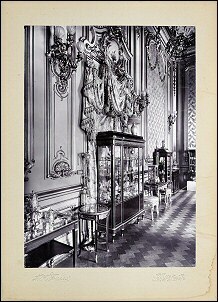 Today many of the items exhibited here are in museums or private collections. But we are here to talk Eggs, so here it goes! 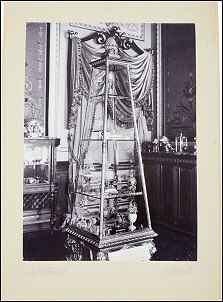 The Eggs were put together in two showcases, see above, one for each Empress. 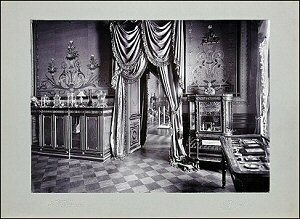 We will start with her Majesty Alexandra Feodorovna's Imperial Easter Eggs, for one reason only; she is the easy one. Her mother in law is the one with the Missing Eggs and it appears this already started in 1902! 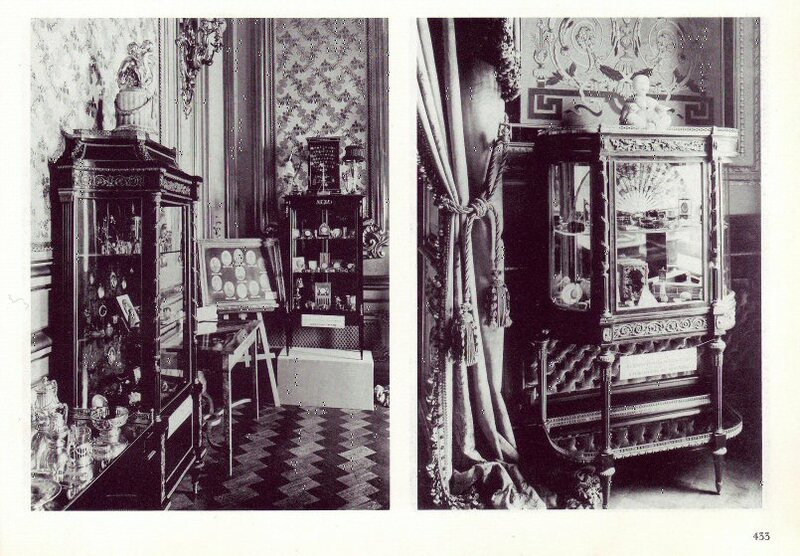 From the cases showing the Imperial Easter Eggs of the two Empresses (photo on the left), we know that Empress Alexandra loaned all her Easter Eggs to the exhibition. 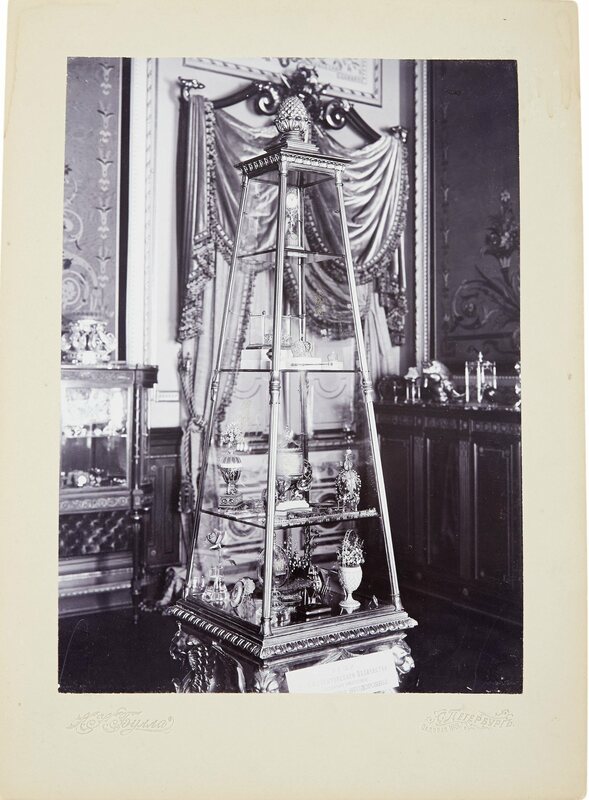 The exhibition was held in March 1902 and Easter 1902 was yet to come, so she had by that time received a total of seven Eggs and these seven Eggs are all visible in her glass case. See if you can find all seven Eggs! NB. One Egg is partly hidden behind the material of the case and one Egg you might not recognize, for its color in black and white seems strange to us today. 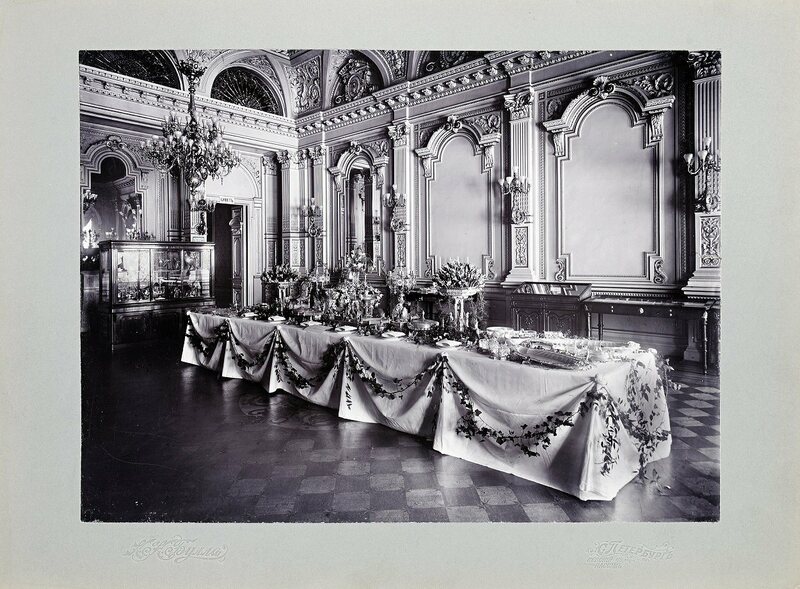 Empress Maria Feodorovna had received seventeen Eggs (see) by the time the exhibition was held. Alas, for her too Easter 1902 was yet to come! Eleven Eggs are clearly visible in her glass case and of one Egg the 1888 Cherub with Chariot Egg the reflection in the glass is faintly visible. See Egg page. Unfortunately we cannot see into all corners and nooks of this case and it is well possible that for instance the smaller 1885 First Hen Egg and the 1889 Nécessaire Eggs are there, but hidden behind other objects. 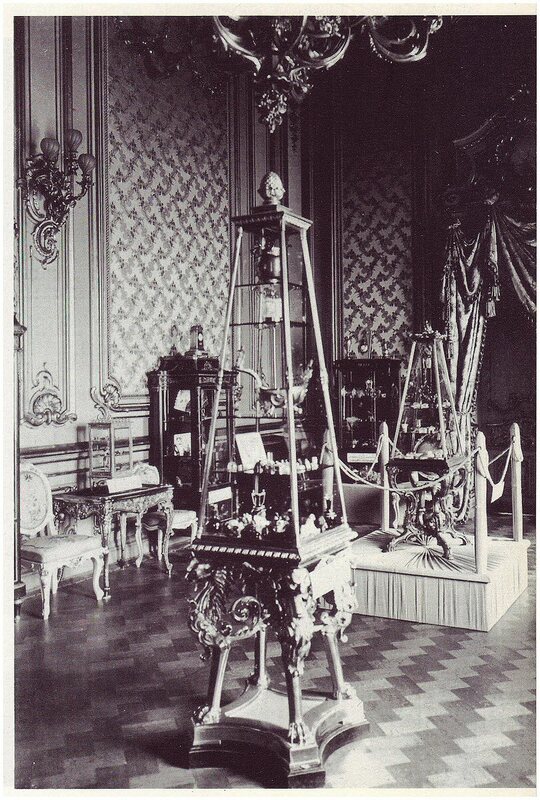 Unless new photographs of this exhibition will appear, we probably will never know, but as it is so often the case with the Imperial Easter Eggs, nothing is impossible! Last but not least, what puzzles me is the 1900 Cockerel Egg. The Egg is so large that it would have been visible even behind other items. The 1895 Blue Serpent Egg is 18,3 cm in height, the 1900 Cockerel Egg 20,3 cm, but I do not see it. I searched all the other photographs of the exhibition too, but no luck. Is that beautiful Egg not exhibited? And if so, why not? different ways. I found Vondervis, Vondervise, von Dervise, von Derwies, von Derviz, von Dervize and of course фон Дервиз. **Title of the exhibition in Russian: Выставка художественных произведений К. Фаберже в особняке П.П. фон Дервиза, Санкт-Петербург 1902 г. Interested reading about the vitrines used in this exhibition? 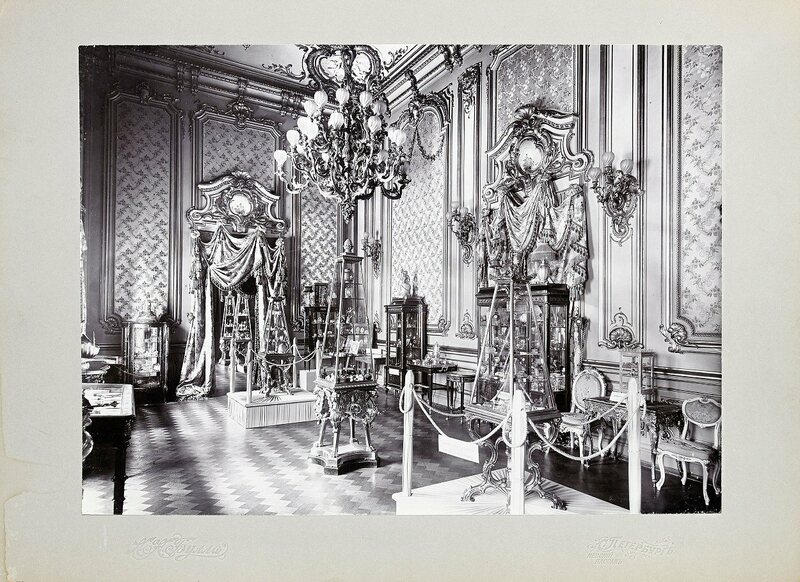 Click here for a nice story in the Fabergé Research Newsletter.